in your home or our studio! If you can dream it, chances are we can put it on a sign. Host a Words on Woo Wine and Sign Party! Your sign is free with a party of 10 or more! Personalized wood signs make great gifts! We do custom orders and ship anywhere. 5 STARS - CHECK OUT OUR REVIEWS! I wish I could give Words on Woods a higher rating beyond 5 because it is just so amazing!! All 3 of my children had their birthday party there. 10 year old's and a 15 year old. They loved it! They created meaningful plaques that they will have forever as well as their friends. Jackie and her husband were beyond kind and accommodating for all of the special requests . They were patient and took the time with each child to help with them bring their creation to life. The location is absolutely beautiful and inspiring and the cupcakes provided were amazing. By and far the best birthday party experience for all of my children. WE as a family can't wait to go back.!!! Went last night for the Coalition For A Better Wallingford fundraiser. What a great time. Very attentive to those of us first timers. I love my sign. I Will be back. Hosted a words on wood party at my home, nothing but good things to say about the whole designing process! Thank you Jackie! I had so much fun making my beautiful sign. Jacqueline has a great personality and is extremely patient with people that lack the crafting gene like myself. She had all the steps to follow carefully organized so it made the whole process a breeze. I highly recommend her and I can’t wait to make another one! I had such a fun night out with some amazing ladies that I work with. I was also able to create a beautiful sign for my new home! I’ve gotten so many compliments on the sign and I owe it all to Jackie! She took the time to make sure everyone received the help they needed! I have had so much fun making beautiful signs for myself and my children. I even made a planter for my herbs! Jackie is a wonderful teacher who is patient and helps when you need her. Being crafty with my friends has been fun, but also quenches my thirst to be creative. I have also given gift certificates to moms to be so that they can have a birth sign made for their babies. I enjoy my time making these signs and laughing with friends! Thanks Jackie and Doug. 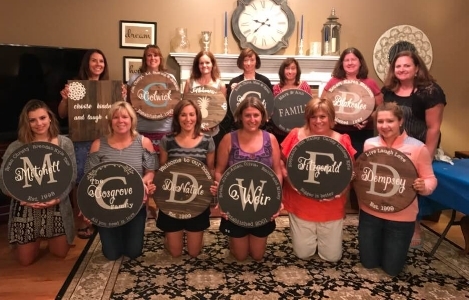 Words on Wood is an absolutely amazing place to go to be creative, artistic, and have a wonderful time with family and friends!!! Anyone who visits this studio will be able to create beautiful artwork for their own homes or for a friend’s home. The process is extremely easy and the owners, Jackie and Doug, are just absolutely incredible. When visiting Words on Wood, you will not only create a work of art, but will also feel welcome and at home instantly! If you visit once, you will absolutely want to come back again! It is very kid friendly too! I went to a party, booked a party, and booked another party! Fun, creativity and best of all with great friends! Jackie is awesome and guides you to creating a cherished piece of art you make yourself. Great girls night out, family night, or even couples night! We needed a new sign for the date of our house. Being a history buff myself, it made sense others would like to know when it was built. I remembered seeing a new shop on Center St “ words on wood” and thought that’s where I should go. Wanting to keep the business local if possible. The sign, the interest of the owners in my endeavor and the outcome are all fantastic! Welcome to a Wallingford!